Some brief notes on my my clan collected from the web, see sources in the links below. 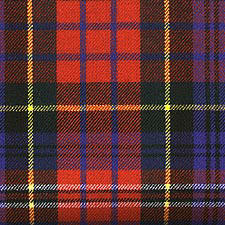 The clan name is derived from the Gaelic, "Mac a’Phearsain", which literally means "Son of the Parson". The Parson referred to was Muriach, the 12th Century lay prior or parson of Kingussie in Badenoch, which lies in the middle of the old Macpherson Clan lands on the upper waters of the River Spey. Muriach's son was probably the first to take the name, and from Muriach's three grandsons are descended the three main Clan families of Cluny, Pitmain and Invereshie. Hence the history of the Clan has been called "The Posterity of the Three Brethren". Many families and branches developed over the years from these main stems. 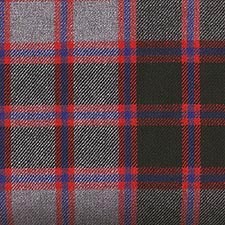 "Cluny Macpherson" is the style adopted by successive Chiefs. "Cluny" in Gaelic is "Cluanaidh", which means a pasture or meadow. In the 23rd Psalm the phrase "pastures green" is represented by the single word "cluanaidh". 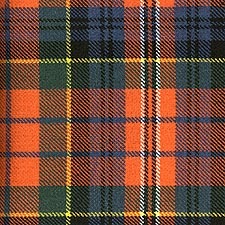 For centuries the Clan Macpherson has been one of the leading Clans in the Clan Chattan confederacy, along with the Mackintoshes, the Davidsons, the MacGillivrays, the Shaws and others. The clan has always played an active and often warlike part in Highland history. In the 14th Century the Macphersons were responsible for the defeat in Badenoch of the Comyns, the enemies of Robert the Bruce. In the same century, together with the MacKintoshes and Davidsons they defeated the men of Clan Cameron at the battle of Invernahavon. During the Civil War Clansmen fought for the King with Montrose. The present Chief is Sir William Macpherson, of Cluny and Blairgowrie. He is descended from William, the Purser of the Clan, who wa first cousin of Ewan of the '45, and who was killed at the battle of Falkirk in 1746. William's son Allan acquired the Blairgowrie estate in 1789, after many years service in India and elsewhere, and succeeding generations have lived in Blairgowrie since then. Sir William is married to Sheila McDonald (nee Brodie), and they have a daughter, Anne, and two sons. Their elder son Alan Thomas remains "younger of Cluny", but Sir William will be succeeded by their younger son James Brodie, since Alan has, with the family's full agreement, stepped out of the line of succession in favour of his younger brother. After the sale of the Cluny estates some dedicated Clansmen were able to purchase important relics and artefacts from Cluny Castle, and these together with many other items of great Clan interest and history and heraldry are housed in the Macpherson Clan Museum in Newtonmore. The Museum is a focal point for present day Macphersons', and it is the home of the worldwide Clan Macpherson Association, which is a thriving organisation with branches in many countries. 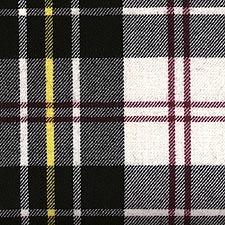 The three tartans in regular use are the grey Hunting Macpherson (as shown above), the Red or Badenoch Macpherson, and the black and white based Dress tartan. The Chief's Crest is "Touch Not the Cat But A Glove", meaning (in its correct interpretation), Touch not the cat when the cat is without a glove. The glove of the wildcat is the soft part of the paw into which the claws are normally retracted. When the wildcat assumes a hostile posture the claws are bared or "ungloved". The motto is a warning to those who would be impudent enough to engage the Macpherson wildcat in battle when its claws are thus "without a glove".